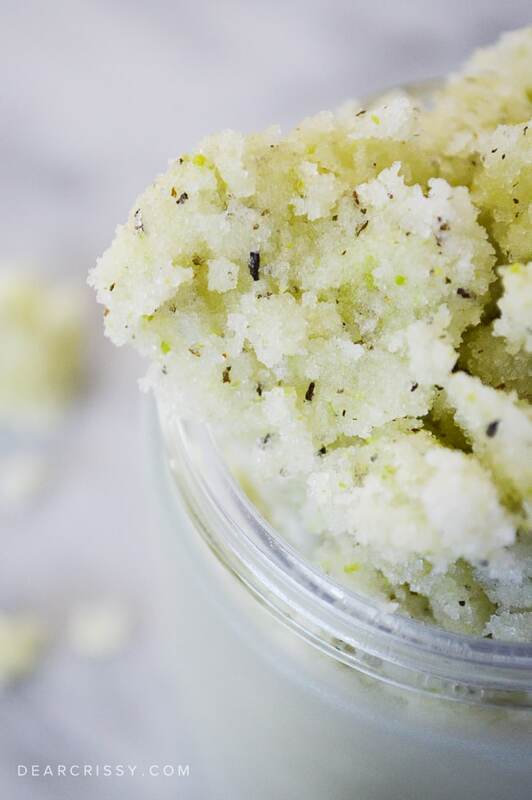 DIY Green Tea Scrub - Fab Exfoliating Sugar Scrub Recipe! Is your skin feeling a bit tired? 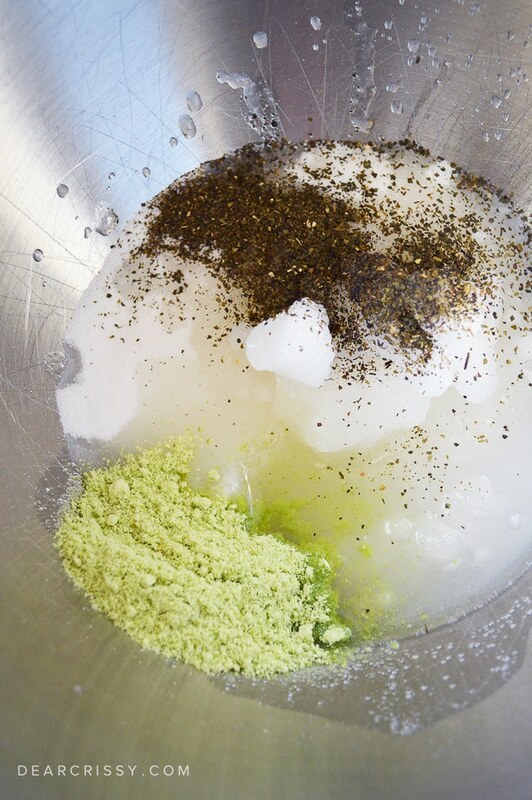 To give my skin a boost I love using this easy DIY green tea scrub. If you’ve never tried making a homemade scrub recipes, this DIY scrub is a great place to start. 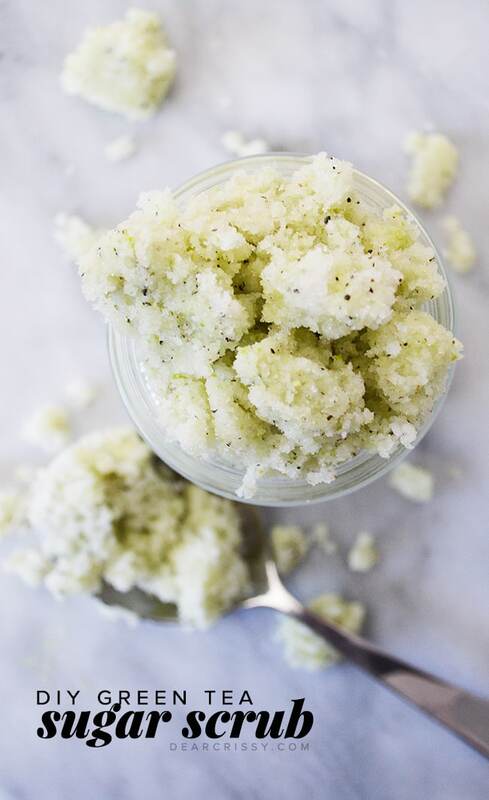 You’ll end up with a moisturizing sugar scrub that will rejuvenate your skin. 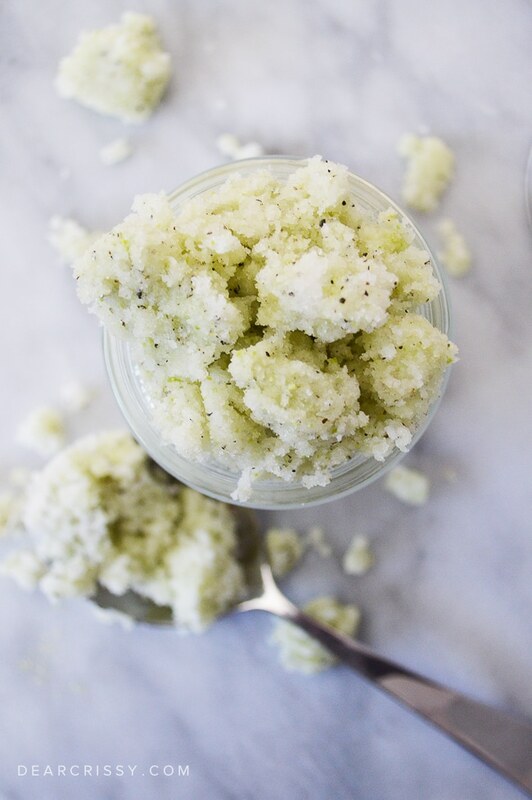 This dreamy DIY green tea scrub is perfect for a quick pick-me-up, or for that perfect night you’ve been waiting for—a night just for you, complete with some quiet time, a good book, a bubble bath and maybe a glass of wine. 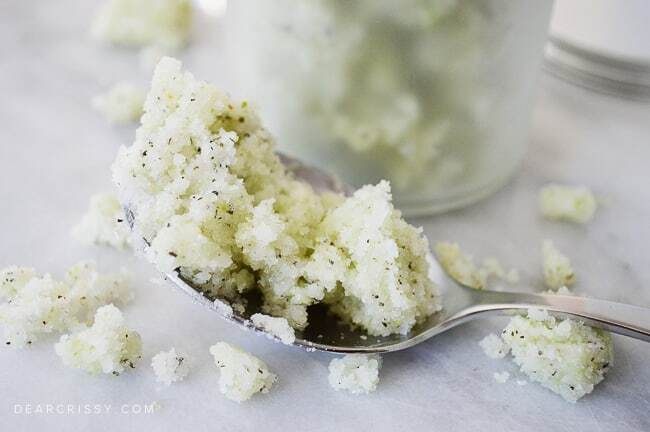 You can even exfoliate in the shower with this DIY green tea scrub or add a couple scoops of it to your bath water and let it dissolve to provide a luxurious bath treatment. I’m feeling more relaxed just thinking about it! 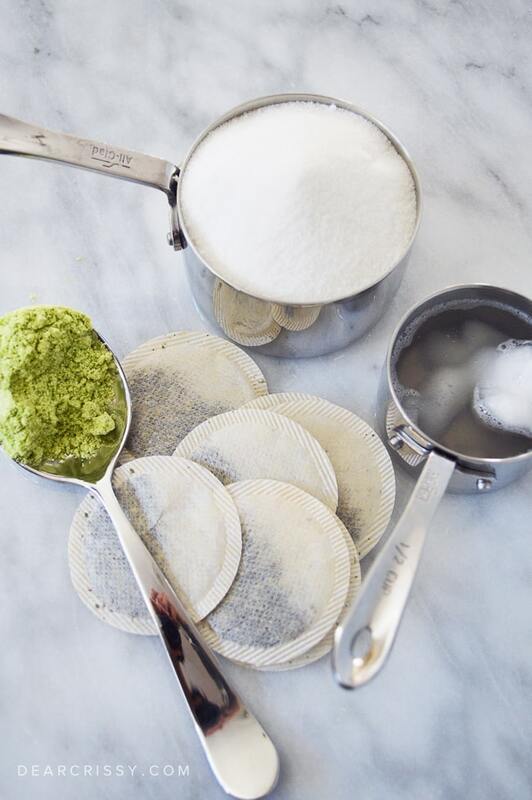 This DIY green tea scrub is super quick to whip together. 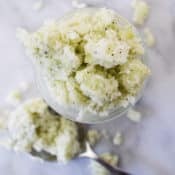 It’s an inexpensive spa treatment and bonus—you very likely have everything needed in your pantry for this fabulous body scrub! 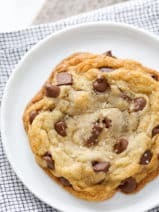 Start with the content from 2 green tea bags (or any other flavor you have on hand or prefer), 1 cup white sugar and ½ to ¾ cup of soft or melted coconut oil (You can use more or less depending on how dry or oily you prefer the consistency to be. I like how exfoliating a dry rub style scrub can be and tend to use less coconut oil). Optional: I added about a tablespoon of freeze dried edamame beans that I ground in the blender. Totally optional, just gave the scrub a nice color-that is totally natural. I picked up a bag of them for a couple dollars-that we do usually eat, at Target, but you can find them online as well. 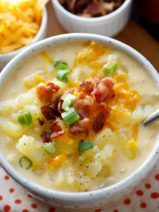 Thoroughly stir all of the ingredients together or toss into the blender or mixer and whip together in seconds. Store in an air tight container until you’re ready to use it. DIY green tea scrub: What makes it special? 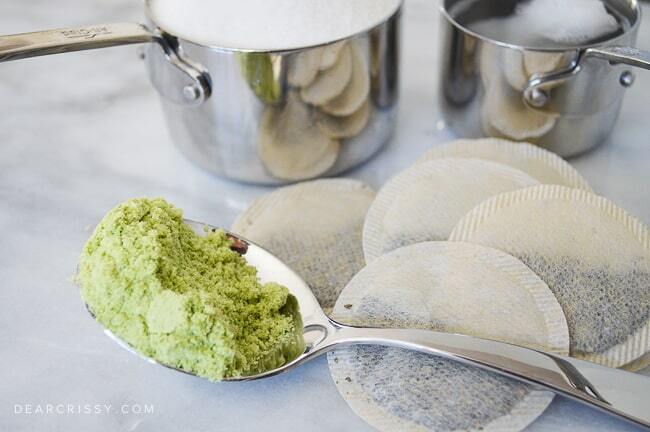 This DIY green tea scrub removes dirt and impurities from your skin, leaving a healthy and beautiful glow. Green tea is a wonderful anti-inflammatory that helps soothe blemishes and scars. If you’re a fan of sugar scrubs you’re going to absolutely adore how this easy, DIY green tea scrub recipe makes your skin feel. Seriously, it’s a winner. As always, take extra care if using our DIY green tea scrub in the shower, as the coconut oil will make the floor slippery. Same goes for the bath if you’ll be using it there or soaking in it. Rinse off all the way and pat dry (rubbing will remove the hydrating coconut oil, you can leave this on as it will nicely moisturize and protect your skin). ½ to ¾ cup of soft or melted coconut oil (You can use more or less depending on how dry or oily you prefer the consistency to be. I like how exfoliating a dry rub style scrub can be and tend to use less coconut oil). Mix all ingredients and enjoy as a body scrub or bath treatment. Just heard about this scrub today and it sounded so simple, I went straight to my kitchen to make it. I didn’t have edamame beans so mine looks like frog eggs, but that’s okay. I let my face soak in some warm water first and then applied. I thought I’d need like a tablespoon of the scrub but it was more like a teaspoon. Rubbed gently for 90 seconds, rinsed and pat dry. My skin feels so smooth, it’s incredible. One major perk is that the scrub is totally edible which is sweet (literally). 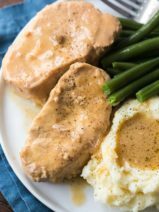 I’ll refrigerate and use again in a week and see how it goes. I’m excited! Because I have friends who are wine makers, I get organic grape skins in the fall, after they harvest. I blend the grape skins and seeds in my Vitamix. This year I added green tea to the sugar, plus a bit of avocado, almond, jojoba, and vitamin E oils in addition to the coconut oil. This is a heavenly mix. It is a gorgeous merlot color because I was given red grape skins ( thus did not add edamame). And yes, it must be refrigerated or it might turn into wine. It makes a lovely Christmas gift. 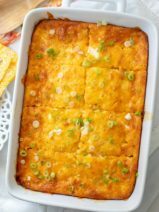 Thanks Chrissy for the inspiration of your blog, as I had not added green tea before, and I really like how it turned out. Omg I love it thanks so much!!!!! My SIL and I made this scrub to give as favors at a High Tea B-day party….How long will it keep? Should it be refrigerated if we won’t be giving them out for a couple of weeks? I’m concerned about the dried edamame spoiling!